Mindful movement is based on the fusing of modern physiotherapy and the ancient breathing techniques and physical postures from traditional yoga. It draws strongly on the teachings of physiotherapists and yoga teachers Simon Borg Olivier and Bianca Machliss. Mindful movement is non denominational and non dogmatic. Everyone is welcome. This one-hour class commences by reconnecting body and mind through breath work and an integrated spinal and abdominal warm-up. Posture sequencing (vinyasa) in conjunction with salutes (surya/chandra namaskar) are used to warm up the body and to prepare the body for deeper inversion and backbending. Students are presented with variations to each physical form so they can tailor their practice to their body’s needs. All classes finish with releasing postures, with student’s enjoying a final blissfully restorative final relaxation “shavasana”. The physical focus ensures that students build up their understanding of how to move safely with deep muscular-sceletal awareness through a complete range of physical forms, whilst the deeper mindful focus ensures that students work with absolute concentration but minimal tension through their practice, enhancing the relaxing aspect of the class. Perfect for beginners, and those coming back after a break ! 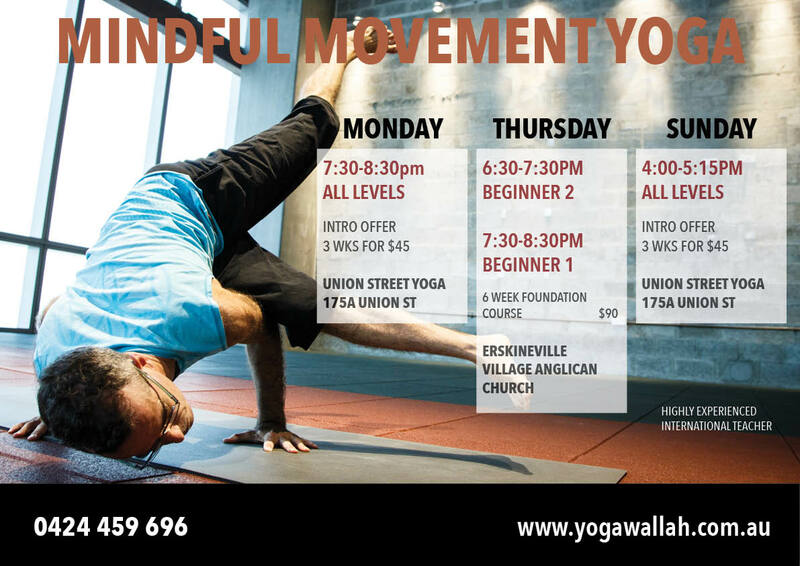 As a special offer to yogawallah members who have already completed the Foundation Course (Level 1) with me, drop-ins to the course will be possible. The normal yogawallah class fee will apply. Those who have not completed the course must enroll for the full course. Please feel free to contact me if you have any questions. The course is highly recommended for those new to the mindful movement practice and also those who would like to deepen their understanding of the practice, and will give you the confidence to start your own home practice. Deepen your practice with 6 challenging themes, emphasising core strength, arm balancing, detoxing, breathwork, upper & lower body strength & flexibility. Perfect for regular practitioners, those attending the Monday open class, and also those who have completed the Level 1 Foundation Course. This course is not recommended for those new to mindful movement work. The Level 1 course is not a prerequisite for this course. Drop-ins are not currently possible for this course. Variations will be given to cater for varying levels of strength, flexibility and experience.